May is a significant month in Charlotte's history, and over the next two weeks there's a coordinated effort to recognize a brave step the city and its residents took 50 years ago. 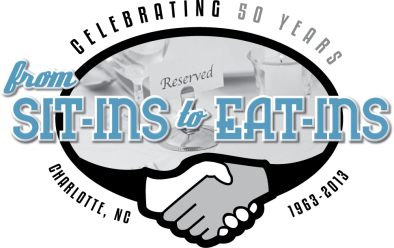 "From Sit-ins to Eat-ins" celebrates the desegregation of Charlotte that occurred in May 1963. It's great to see that several organizations are coming together to present these events. I hope it serves as a reminder to us that 50 years isn't all that long ago, and if people from different walks of life could work together decades ago on something as serious and monumental as desegregation, most of our issues today aren't as difficult as we make them out to be. Below are details from the press release, including the list of community events (admission is free, except where noted). Charlotte made national headlines in May 1963 when Chamber of Commerce members led by Mayor Stan Brookshire voluntarily joined with African American leaders to go two-by-two and desegregate Charlotte’s leading restaurants. This “eat-in” came three years after the sit-in movement had opened lunch counters. Charlotte Civil Rights activist Dr. Reginald Hawkins triggered the action, leading a march on May 20, 1963 from Johnson C. Smith University to the Mecklenburg County Courthouse and declaring “We shall not be pacified with gradualism; we shall not be satisfied with tokenism. We want freedom and we want it now.” His call echoed a spirit of revolution dating to the Mecklenburg Declaration of Independence demanding freedom from England, which tradition holds was signed on May 20, 1775, a year before the 1776 US Declaration of Independence. The successful desegregation on May 29-31, 1963 – a year before the 1964 U.S. Civil Rights act required desegregation of “public accommodations” – pushed Charlotte into the national spotlight. The city’s progressive action contrasted sharply with the massive resistance then going on in places such as Birmingham, where police chief Bull Connor turned fire hoses and police dogs on young Civil Rights protesters that same month. It was a key turning point in Charlotte’s emergence as a major Southern city. Organizers of this two-week celebration include: Levine Museum of the New South, Mecklenburg Ministries, The May 20th Society, Charlotte Mecklenburg Community Relations, and Mert's Heart & Soul, with assistance from Charlotte Center City Partners, Charlotte Chamber, Queens University, Johnson C. Smith University, and the Carolina Room of the Charlotte Mecklenburg Library. Several participants from the 1963 desegregation march in Charlotte will be a part of this panel discussion, including the son of Charlotte activist Dr. Reginald Hawkins, who marched beside his father in 1963; Jack Claiborne, who is a long-time reporter for The Charlotte Observer and covered the Civil Rights movement locally; Evan Faulkenbury, who has studied Dr. Hawkins’ life; and Patricia A. Albritton, board chair of Charlotte Mecklenburg Community Relations Office. 2:30 p.m. First United Presbyterian Church, 406 N. College St. Scheduled speakers include Malcolm Graham, attorney Charles Jones, James Ferguson, Dr. Reginald Hawkins, Abdullah Salim Jr., and Mayor Anthony Foxx. 10:30 a.m. Johnson C. Smith University, 100 Beatties Ford Rd. Event will include cannons, a reading of the Mecklenburg Declaration of Independence, and a celebration of Mecklenburg County’s 250th anniversary. 11:30 a.m.-12:30 p.m. The Square, corner of Trade and Tryon streets in Uptown. The Pulitzer Prize-winning author of Warmth of Other Suns will connect her research on 20th century African American history with the Charlotte 1963 history. 7:30 p.m. $12. McGlohon Theater at Spirit Square, 345 N. College St., blumenthalarts.org. To mark the city's historic desegregation, some of today’s civic leaders will kick off two days in which Charlotteans are urged to invite someone of a different race to lunch. Throughout Charlotte. Music and munchies set the mood in 1963. Participants in the 2013 eat-in reflect on history, share what they’ve learned, and suggest hopes for future. Hosted by Mecklenburg Ministries’ “Friday Friends.” 5:30-7 p.m. Levine Museum of the New South, 200 E. Seventh St., museumofthenewsouth.org. You can also find details at www.may20thsociety.org and www.meckdec.org.